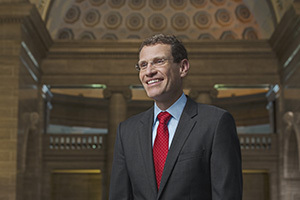 Clint Zweifel is Missouri’s 45th State Treasurer, first elected in 2008 and reelected in 2012. Prior to serving as State Treasurer, he served in the Missouri House of Representatives for three terms, representing parts of Hazelwood and Florissant in North St. Louis County. Treasurer Zweifel graduated from the University of Missouri—St. Louis with a Bachelor of Arts in political science in 1996 and a Master of Business Administration in 2001. During his time in office he dramatically expanded Missouri’s small business lending program and returned record amounts of Unclaimed Property. He also advocated for vulnerable populations through the Missouri Housing Development Commission and worked to lower the cost of saving for higher education through MOST. Mr. Zweifel and his wife Janice have two daughters, Selma and Ellie.